Hello Reader! Big Quentin Tarantino? Love Movies that have a Film Feeling that’s full of entertainment and good Acting? Well Check the news below along with a Trailer. The Hateful Eight finally gets a Trailer full of good-looking cinematography. Also full of Samuel L. Jackson but so far low on action which is a good thing as it doesn’t give us the whole movie in a trailer. For me this a day one view on the Big Screen but sadly wont be able to see it on a 70 mm which is Highly recommended by Quentin Tarantino. Check the trailer below and leave your comment on what you think about it. 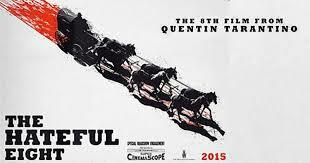 The Hateful Eight Stars Channing Tatum, Samuel L. Jackson, Kurt Russell, Jennifer Jason Leigh, Zoë Bell and Directed by Quentin Tarantino. The film hits Big Screen on January 8, 2015 also on a special 70mm if available in your location. Plot: In post-Civil War Wyoming, bounty hunters try to find shelter during a blizzard but get involved in a plot of betrayal and deception. Will they survive?